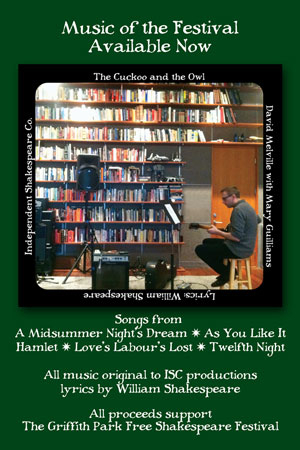 Have you heard Independent Shakespeare Company’s new CD, The Cuckoo and the Owl by David Melville (with Mary Guilliams) yet? It includes original songs from ISC productions of A Midsummer Night’s Dream, As You Like It, Hamlet, Love’s Labour’s Lost, and Twelfth Night featuring Shakespeare’s lyrics. You can preview the songs HERE and purchase it on iTunes. There are some beautiful songs and I highly recommend it. All proceeds support the Griffith Park Free Shakespeare Festival.